Intravascular Ultrasound (IVUS) is one of the most exciting new techniques available to investigate venous disease. It has been available at The Whiteley Clinic Bond Street since Autumn 2014. This is an ultrasound probe which is passed up inside the blood vessels. For venous experts such as those at The Whiteley Clinic, this means an ultrasound that is passed up inside the veins. Unlike duplex ultrasound scanning of the veins which is used to show the flow of blood, intravascular ultrasound scanning (IVUS) only produces a greyscale image of the vein from the inside. This is basically a black and white image of the vein around the probe and anything immediately outside of it. The intravascular ultrasound probe (IVUS) is very small and is on the end of a very thin catheter that can be passed up inside the vein. Under local anaesthetic, a needle is passed into the vein and this catheter can be passed up whichever vein is being examined. It is most commonly used in the pelvic veins above the groin. The intravascular ultrasound (IVUS) is passed up as high as is required and is then pulled down slowly, at a constant rate, obtaining a complete picture of the vein it is within. The intravascular ultrasound (IVUS) can see narrowings or blockages inside the veins that cannot be seen by duplex ultrasound, venography, CT or MRI (MRV). Because the pelvic veins are deep inside the pelvis, all of these other techniques struggle to get a good view of the veins. In contrast to this, the intravascular ultrasound (IVUS) is already inside the vein and so even the slightest abnormalities are easily seen. 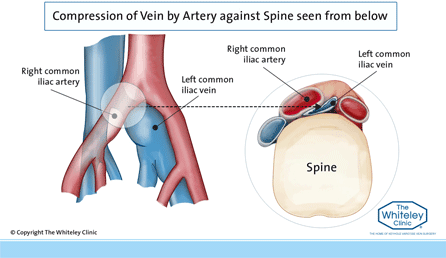 More impressively, if there is a narrowing caused by something pushing on the vein from the outside (such as an artery in May-Thurner syndrome), both the narrowing of the vein and the cause can both be seen. 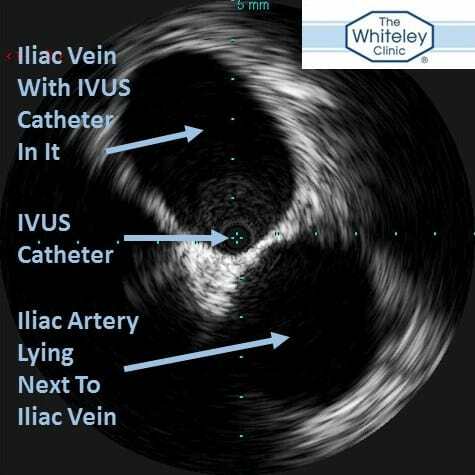 Who needs intravascular ultrasound (IVUS)? Most people with varicose veins or venous disease do not have narrowings or blockages but have valves that have failed. It is only a small proportion of patients with venous disease that have these narrowings or blockages. All of these patients may have their problems due to a narrowing or blockage in their pelvic veins. 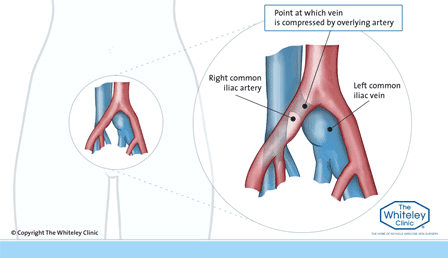 If the intravascular ultrasound scan (IVUS) confirms that this is the case, such patients can now be cured by using a balloon to dilate the vein and a metal stent to keep it open. This ability to treat patients with such conditions has revolutionised venous surgery in recent years. Many patients who have been told that they need to spend the rest of their lives in compression bandages or support stockings have been able to get back to normal life by having had the narrowing or blockage diagnosed with IVUS and then opened by a balloon and stent.